We boost local search rankings and increase leads and sales using our proprietary local listing optimization method. We also use social media marketing, search engine marketing and an improved online “presence” to give you a dominant advantage over your local competitors. 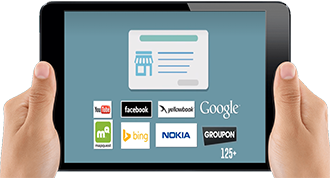 An absolute must-have service for any storefront business to be competitive online. The higher you rank in local search results and the more times your info is on page one, the more customers you will have calling your business and coming to your door. Today’s customer uses the local search results on Google and other search engines like past generations used the Yellow Pages. That’s why every plumber wanted to be listed as “AAAA Plumbing”…so they would appear first. The same strategy applies today, only now 82% of customers search online for your products and services and that’s where you need to be first. If you aren’t visible on page 1 and in the Google My Business map, you’ve already lost the battle with your competitors. But if you DOMINATE there, you’ll beat your competition to those buyers with ease. Google listing changes are tracked daily, and ranking progress for your primary keywords is measured monthly using our “Rankings” and “Google My Business” reports. A key component of our social media services that integrates a positive social review catalyst/negative review interceptor with reputation management to ensure that your social review ratings are optimized for maximum benefit to your online reputation. Instant notifications of new reviews are sent automatically by Google, Facebook and Yelp and overall progress is measured monthly using our “Reviews & Ratings” report. Page enhancements include custom layouts, tabs and call to action buttons based on your specific type of business. We improve the customer experience, which drives a measurable increase in customer interactions and conversions. No matter the current state of your online presence, we will work with you to develop a strategy and execute it flawlessly to achieve real, measurable results. Sign up now and we’ll help you dominate your local competition. We have created a customized online presence package for NutriMost franchisees transitioning to licensees that includes a robust online presence with a full-featured website, local and global search optimization and hosting/maintenance included to deliver a very competitive presence for your custom branded business. We also offer an add-on featuring intelligent 2-way SMS communication with clients, a chat interface plus additional features under development that will enhance your ability to focus on communication, support and client satisfaction as you grow your newly branded business. Our Local SEO service was designed by a former member of Google’s algorithm team, and what it does is optimize your business listing on Google, Yelp, Facebook and hundreds more high traffic online business directories and map/navigation apps, pushing you right past your competitors to the very TOP of local search results. When a potential customer searches for your product or service, Google and other search engines identify their location, and then targeted search results local to them are displayed FIRST. For example, if someone searches “personal injury attorney” and they happen to be in Irvine, California, attorneys in Irvine will be displayed in a list and on a map (“Google My Business”) at the top of the page, above the organic listings. That’s where our Local SEO service puts your business info…so that those prospective customers are more likely to choose you over your competitors. The higher you rank in local search results, and the more times your info is on page one, the more customers you will have calling your business and coming to your door. Today’s customer uses the local search results on Google and other search engines like past generations used the Yellow Pages. That’s why every plumber wanted to be listed as “AAAA Plumbing”…so they would appear first. Same strategy applies today, only now 82% of customers search online for your products and services, and that’s where you need to be first. If you aren’t visible on page 1 and in the Google My Business map, you’ve already lost the battle with your competitors. But if you DOMINATE there, you’ll beat your competition to those buyers with ease. Focus on enhancing online presence by improving organic search rank for primary keywords, optimizing social profiles and directory listings, and combating “fake review” sites by means of promotion of company-controlled content to page one of organic search results.